Last month we returned home after a few weeks away. While catching up with the backlog of ‘normal’ life I paid little attention to the pot plants on the windowsill, except for a slurp of water every so often. 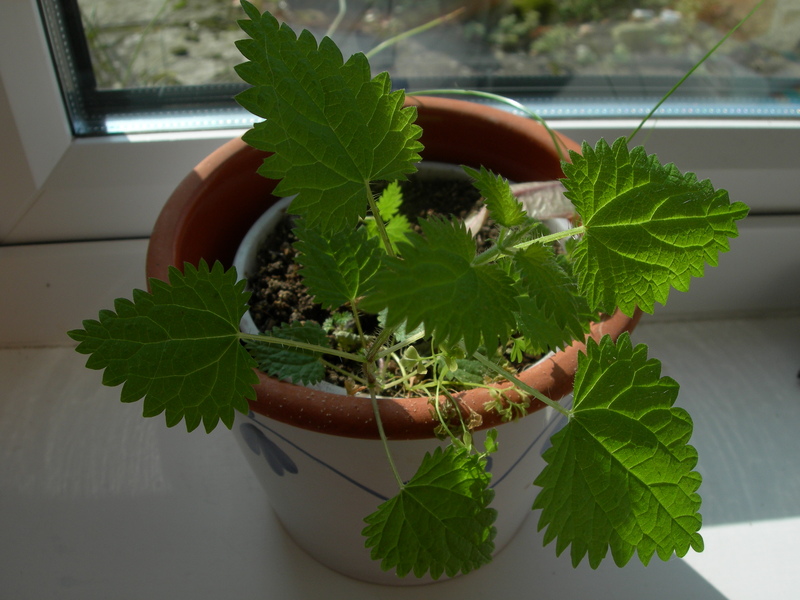 Then the other day I noticed that I had been harbouring a young green nettle on the kitchen windowsill. The nettle in the flowerpot lurked there for weeks until it was spotted, and then it became glaringly obvious. As you can see, the original plant was overwhelmed by the misplaced weed. It can be much the same with words: a rogue word or a misplaced comma may lurk unnoticed in a sentence for days, weeks or forever. Like the nettle, the effect if it’s not weeded out may not turn out to be what you really want. Misplaced commas, for example, can cause as much havoc in a sentence as nettles in a flowerbed. You may have noticed a type of word-nettle that’s popping up all the time in letters, like this one: “As a teacher, I believe that you will be interested in our software for schools”. The writer, who is marketing software, thinks he/she is addressing a teacher but actually claims to be a teacher, “As a teacher, I..”. The qualifying phrase “As a teacher” is in the wrong place next to “I”; if it snuggles up next to “you” the meaning becomes clear: “I believe that you, as a teacher, will ..”. Over the next few weeks we may unearth a few more word-nettles. Meanwhile, if you are short of time and would like someone to check your verbal flowerpots, perhaps I could assist? This entry was posted in Language and tagged Commas, Common error, Letter-writing, Nettle. Bookmark the permalink.